Glenn Springthorpe, manager at the city council’s Woodthorpe Grange Nursery, on the plants which will attract bees and butterflies to your garden. Here at the nursery we’re now into the next production phase of potting up autumn bedding plants like polyanthus, pansies and wallflowers. This might seem a bit early considering now is also the time when our summer floral displays throughout the city are looking at their best, despite the recent poor weather. Most of the summer annuals we planted out in late May and June are now producing their colourful blooms that help to brighten up even the dullest summer day; but of course our planting designs don’t solely rely on flowers to provide colour. We also use varieties that are more popular for their foliage colour like coleus, cineraria, ipomea and kochia. The subtle leaf tones of these species act as a foil when planted alongside more vibrant colourful plants like begonias, marigolds and pelargoniums. Our displays were recently assessed by the Royal Horticultural Society as part of Nottingham’s entry in to this year’s East Midlands in Bloom competition, and we expect to get the results in early September. One of the judging criteria concentrates on environmental responsibility and the benefit of wildlife and conservation, and we try to support this using plants in our displays that provide nectar and pollen for butterflies, bees and other pollinating insects. That’s why we’ve been growing bedding plants such as rudbeckia, single dahlias and salvias, as well as using perennials like buddleja, lavender and verbena. If you want to attract these beneficial insects to your own garden, it’s best to avoid planting double-flowered varieties of bedding plants that don’t hold much pollen and nectar. 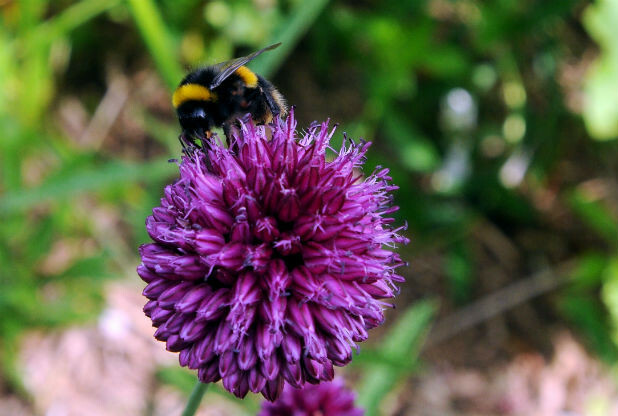 Single-flowered plants, as well as native species and herbs and fruit trees, are all great for attracting pollinators; and of the summer flowering bulbs try alliums, as butterflies seem particularly keen to sample their nectar. Whichever plants you decide to use it’s fascinating to watch these creatures busily enjoying the benefits of the flowers, whilst appreciating them ourselves.